The LifeDop 250AR has it all, a display unit with superior sound quality, extended battery life, enhanced probe sensitivity, interchangeable probes and a one-year full warranty. The large informative display shows battery life, signal quality and extended 50 to 220 bpm heart rate. It includes a battery recharging system where you don't have to worry about overcharging or draining the batteries, and includes a built-in audio recorder with download capability - a first in the market. The 2 MHz obstetrical probe is optimized for deep penetration and third trimester pregnancy. Ultrasound Probes/Dopplers can be found in our extensive online collection of products from globally recognized and trusted brands, including Summit Doppler. 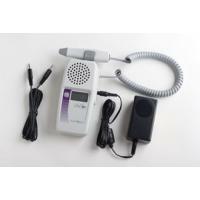 An excellent option to consider is the Summit LifeDop Display Hand-Held Doppler with Recharger and Audio Recorder.